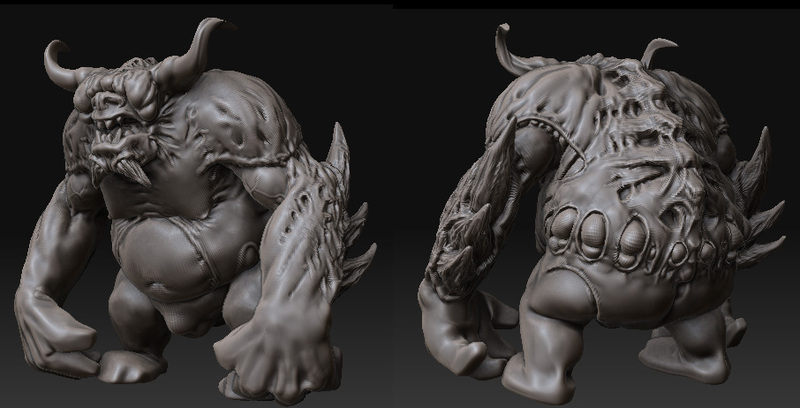 Been workin on this guy on and off for the last month, been through several iterations and failed ideas. My first polypaint model as well. Final renders are from max, bit of a rush job but I'm happy with how it came out. I made him as an excersize in creating a generic boss monster type creature (though this is pure high poly, not game-res). Scary as hell but with a vulnerable spot that you've gotta nail with your bow and arrow or whatever to take him down (that would be the bulbous bits on his stomach). Last edited by ferg; 08-18-09 at 02:18 PM. What up Ferg! Nice to see you here. Well done on your model. Cool design, nice paint/texture, nice render. Parhaps a sketchbook would be in order. Would be great to see more of your work. Much more Unique than the average mutant. Great skin work, makes it much more convincing. The bastards definately a mutant X_x. It would remove the odd, hey that monster has ugly 80 year old lady boobies effect. Which I can say, ive never seen untill now. hehe. Smells like Top Row on 1st post! This is one top row monster...great work and nice texture....total awesomeness! First post? Gulp! Very interesting monster and wonderfully executed! Looking forward to more stuff from you! Hey ferg, that's an awesome concept and sculpt man! Glad you decided to post, it's very 5 star-ish and very Top Row-ish... . ! ****, I totally lost track of this! Thanks for all the replies guys! I'm planning on doing another texture pass soon, to break up the horns/skin similarities, among other things. I guess I'll turn this into a sketchbook thread, here's a random mess of quickie zbrush sketches from the past 6 months or so. thanks for checkin it out!